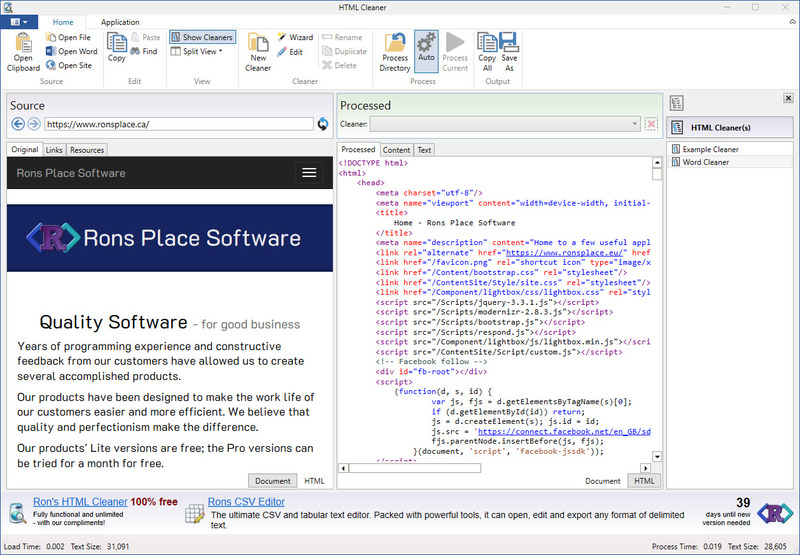 Rons HTML Cleaner uses lists of editable rules, called Cleaners, to achieve the cleaning, formatting and layout of HTML that is generated by rich editors (such as Word), before being published to SharePoint, on a Content Management System (CMS), or Blog. It also lists both the anchor and media links in the document and checks that they actually work in the background. This is all done in two simple mouse clicks. When a document is processed the content is also extracted to show just the article and images without the web page extras surrounding. More information concerning Rons HTML Cleaner can be found on our website: https://www.ronsplace.ca/Products/RonsHTMLCleaner. The developer welcomes feedback and ideas.